2 Bedroom Semi Detached House For Sale in Milton Keynes for Asking Price £280,000. NO UPPER CHAIN Immaculate 2 double bedroom home set on a quiet road in the highly sought after location of Brooklands, close to excellent road links and schooling. 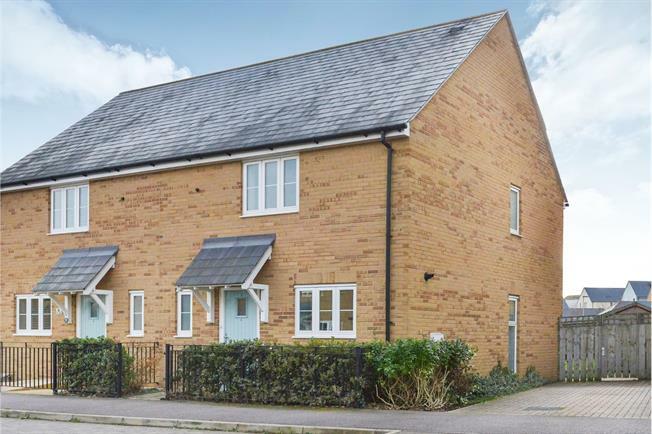 This property is within a short drive to Central Milton Keynes shopping centre and main line station and is also within very easy reach of Kingston District Centre with its array of supermarkets and restaurants this home is perfect for any First Time buyers or investors. This home in extremely spacious throughout and must be seen to be fully appreciated. In brief the accommodation comprises entrance hall, downstairs WC, large living dining area with French doors to the rear giving you plenty of natural light. The modern Kitchen has integrated appliances including oven, hob, extractor, fridge/freezer and space for washing machine. To the first floor are two DOUBLE bedrooms and a modern family bathroom. To the rear you have a fantastic size non over looked garden. To side of the property is your driveway for two cars. Modern fitted kitchen with double glazed window to front elevation, fitted with matching base and eye level units, granite effect worktops, inset sink & drainer, integrated oven, hob, extractor, fridge/freezer, space for washing machine.